FINAL DECISION: I love the cross-class story where the man is of the lower class. Here, there was a bit of angst, a bit of drama and I really liked that the characters knew the value of characters over title or privilege. THE STORY: Felicity, Viscountess Barbridge, killed her abusive husband in self-defense. Now her secret is in the hands of her family’s enemy. In order to track down the potential blackmailer, her brothers call in Asher Seyton, solicitor and financial advisor, to help with the financial investigation. Asher is the son of a servant and grew up with Felicity and her brother. Asher broke Felicity’s heart when after a kiss, he left her. Now Felicity and Asher have to face their long ago feelings and the current threat on Felicity’s future. OPINION: I love books with cross-class romances — especially ones where the man is of a lower class because it upends the normal trope. Here, Felicity is an aristocratic woman, the daughter of an earl and Asher is the son of her father’s valet. The two were children together and friends (along with Felicity’s two older brothers). As Felicity grew up, however, an attraction grew between Felicity and Asher. At her debut six years ago, the two had their first and last kiss as Asher left the next day. Felicity married the Viscount who beat and abused her. Now Asher has returned at Felicity brother’s request because Felicity is in danger. 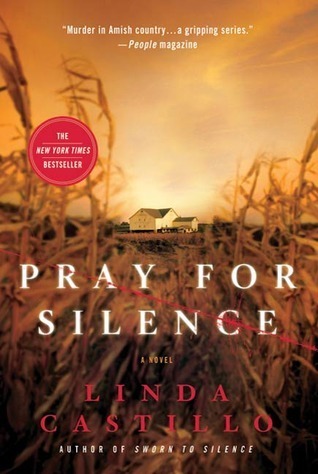 In the prior book in the series, an enemy of the family has found out that Felicity killed her abusive husband in self-defense. The potential blackmailer must be tracked down before the secret is revealed, ruining Felicity and her family. This plot moves the story along, but the center of this book is the romance between Felicity and Asher. Felicity is a woman who has closed herself off after her horrible marriage. Fear, disappointment, lack of trust in herself and others dominate her life now. When Asher returns, Felicity begins to feel again and wonders if she can at least have a sexual relationship free from fear. Asher and Felicity are good people who got torn apart by their class differences. Asher feels keenly the class differences. I thought this book did a really good job of showing that even if Felicity *thinks* that the two of them were always equal, Asher’s reality was something different. There is something very sweet and gentle about these characters together and yet their is definite heat in their relationship. I liked these characters quite a bit and the story is not dark or angst filled but rather is about two people working their way through past obstacles and finding a future together. This is an enjoyable read and a fine conclusion to series as it wraps up the ongoing storylines and gives readers a look at all the characters coming together and solving the mysteries that have arisen. WORTH MENTIONING: Everyone gets what they deserve in the end. 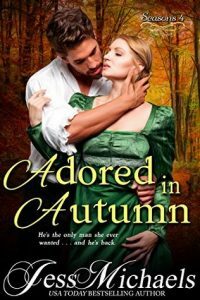 CONNECTED BOOKS: ADORED IN AUTUMN is the fourth and final book in the Seasons series. The romance in this book is self contained by there are continuing storylines that depend upon the prior books in the series. FINAL DECISION: Filled with angst, longing, pain and love, this book made me fall in love with Lucien, a man who can’t help but love the woman who broke his heart. The path from his complete brokenness in the prologue to the ending was a fantastic journey. THE STORY: Lucien Danford, Earl of Stenfax had his world destroyed when the woman he loved abandoned him to marry a duke instead. Lucien is determined to stay away from Elise, Duchess of Kirkford, now that she is widowed but he cannot deny thinking about her. When the two unexpectedly end up in the same place, the anger and passion explodes between them. The past is an obstacle that Lucien and Elise cannot seem to overcome even as they cannot resist one another. OPINION: This book begins with one of the most devastating depictions of a broken heart that I think I have read in a romance book. It immediately made me fall for Stenfax. A man who could love that deeply is a good man indeed. I was also surprised with the direction that Michael’s took with Lucien’s despair. I thought it very brave to depict his reaction in such a manner because some people would see him as weak. I didn’t but there are still stigmas. Everything about Lucien was wonderful. Even angry and brokenhearted he is such a wonderful human being in how he treats Elise that I just wanted to hug him. My sympathies were completely in Lucien’s corner and thus I was prepared to dislike Elise, but instead, I felt sympathy for her as well even as her motives remain murky. She is a desperate woman and her situation is so untenable and it is imperative to remember how few choices women had in the past. Elise is left with nothing else other than using her body to save herself. These two are so desperate to be with one another even as they know it is hopeless. I love the amount of angst and pain in this story because the darker the journey, the more beautiful the happy ending. Both Lucien and Elise are put through the wringer in this book. Even as the truth comes out, there is still pain and betrayal for the two to overcome. In addition to the angst filled romance, I really enjoyed the interaction between all the prior series characters. They have intriguing interaction among one another. There is caring and anger and it is clear that Lucien and Elise are the pivot in this book with all these people. I’ve liked these characters in the prior books and it is nice seeing them again in substantive ways. Finally, there is a nice plot which motivates the actions of the characters. That story is clearly going to continue in the next book in the series (not the romance but the overarching plot) so be prepared to accept that when reading this book. WORTH MENTIONING: Felicity is up next. CONNECTED BOOKS: ONE SUMMER OF SURRENDER is the third book in the Seasons series. This book can be read as a standalone although it has more power having read the other two books in the series. FINAL DECISION: This was a book that slowly built the relationship between the hero and heroine. By the time the book ended, I adored them as a couple. THE STORY: Celia Fitzgilbert is recovering socially from a broken engagement when she meets the reclusive Duke of Clairemont. There is something special between them from the moment they meet. Celia is thrilled that she might actually find a man she can love. But the Duke of Clairemont is actually an imposter who is masquerading as the duke to uncover a murderous traitor. 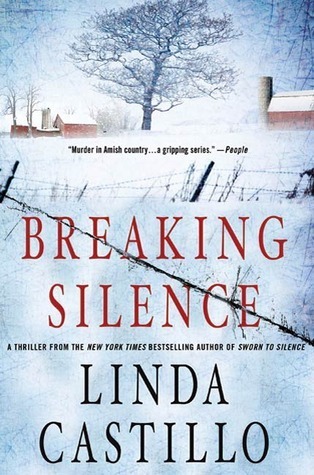 OPINION: This one quietly crept up on me as a book I really enjoyed. There was a bit of suspense in determining what happened to the real duke and also the story behind the hero. What I loved best was that while the two were falling in love under false pretenses, the truth is that both had things to hide. When the hero’s secret is revealed, Celia is shocked and upset but then realizes that there is much she can forgive. The sweetness of their story after the big reveal made me love the romance between these two. Everything seems hopeless and yet there is still a possibility for a happy ending. Best of all, there is no magic wand at the end. These two have to live with challenges because of the hero’s past but love makes all of it worthwhile. I liked Celia as a character. She is pragmatic and willing to forgive when I expected drama when the deceit is revealed. To have the man she falls in love with go from a duke to a not-duke might be expected to make a woman despair about all she has lost. But Celia truly only loves the hero and is willing to sacrifice much to be with him. An oh, how I loved the hero. I especially liked that he is truly a nice guy. His conscience clearly bothers him as his interacts with Celia. Accomplished and unexpected in what his story turns out to be. Michaels does a great job of having seemingly unexpected pairs work well together. There are a lot of secrets at play in this book and I don’t want to give away anything more. I do want to say that I liked this book even more than the first in the series. There was just an easiness with the characters and their relationship. I expected more drama and angst and while there are many secrets to be revealed, the characters themselves have a core commitment to their feelings for one another that gave me a warm feeling. WORTH MENTIONING: Oh, I can’t wait to read what is going on with Stenfax. CONNECTED BOOKS: A SPRING DECEPTION is the second book in the Seasons series. It can be read as standalone although there are connecting characters and an overarching story. This book gives all the information a reader needs. He lifted his fingers to the top button of her gown and unfastened it, letting his fingers slide into the gap he’d created. FINAL DECISION: I very much enjoyed this book of these two people who are on opposite sides of their siblings upcoming marriage. I thought the story and connection between the characters was good and I found their story sweet if a bit simplistic in its resolution. THE STORY: Mrs. Rosalinde Wilde is a widow traveling on her way to her sister’s wedding when a snowstorm forces her to stop at an inn. There she meets Grayson Danford. The two end up having dinner together in the crowded inn and then decide to spend the night together — two people attracted to one another knowing almost nothing about one another. A night of passion out of time. How surprised they are to discover one another again as siblings of the couple getting married where Gray is determined to stop the wedding. OPINION: AN AFFAIR IN WINTER is the start of a new series, and I think this series has great potential. This book begins with a 19th century one night stand between the hero and heroine. Although the night is special for both of them, they part in the morning never intending on seeing one another again. Of course, they end up being siblings to a couple getting married. The two are placed in opposition as Rosalinde supports the marriage, while Gray is opposed. The one night stand, of course, complicates what would have been a pure adversarial relationship between Rosalinde and Gray. I loved that these two are so likeable when the events easily could have led either of them into being conniving and betraying any possible relationship between them. Everything between them ends up being handled in such a reasonable and deft manner, that I never moved from my initial liking of the characters. Rosalinde is recovering from a bad marriage, but she never loses her optimism and her belief in the joy and love of life. And despite a love match gone wrong in her own life, Rosalinde wants love and happiness for her sister. Gray is determined to avoid love after seeing both of his siblings suffer because of bad relationships. He cannot resist Rosalinde despite his resolution. Both are incredibly loving siblings (even when they are wrong) and this essential characteristic gives these two a foundation that connects them in unexpected ways. Even when they are at cross-purposes, there is an essential element of caring that keeps them from being torn apart. I thought that their evolution of their viewpoints of their sibling upcoming marriage was amusing but also represents their intelligence and the complexity of the situation. The ultimate lesson is that people should be free to make their own choices having all relevant information. The connection between Gray and Rosalinde is hot and intense — even in proper society dress. I really only had one complaint and that is that the solution to all the dilemmas seemed too simple and didn’t necessary convince me completely. Despite that, however, I enjoyed this book and look forward to future books in the series. WORTH MENTIONING: Oh, now I really want to read Gray’s brother’s story. I think that is going to be an angst filled one. 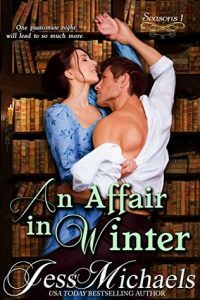 CONNECTED BOOKS: AN AFFAIR IN WINTER is the first book in the Seasons series.